It’s officially spring, which means fresh local produce is just around the corner. Are you excited? Get excited! Along with asparagus and peas, one of the first vegetables to show up at the farmers market is the potato–new potatoes, to be precise. New potatoes’ skin is more tender than their fully-grown cousins because they’re harvested before reaching maturity. They tend to be less starchy too, making them suited for roasting, steaming, and braising. Braising is one of the most under-utilized methods of cooking vegetables, in my humble opinion. 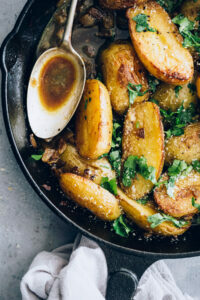 These Braised Fingerling Potatoes are one of my favorite spring recipes because the braising process adds so much flavor, resulting in a dish with simple ingredients that never fails to impress. 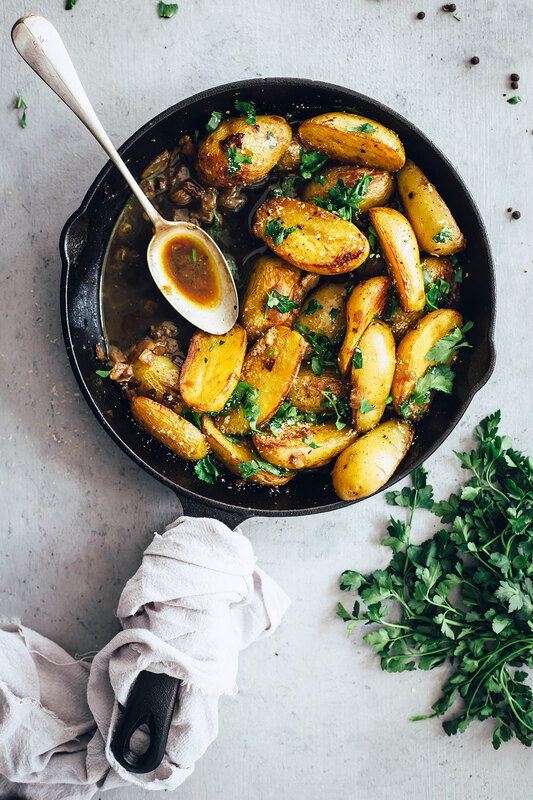 To braise potatoes, you’ll first cook them in a skillet with oil until they’re nicely browned. This gives the outside that nice, pan-seared flavor. Next, you’ll add vegetable broth, cover the skillet, and finish cooking the potatoes in the oven. This steams them to tenderness and infuses them with flavor. The braising liquid thickens into a sauce that can be spooned over the potatoes when serving. 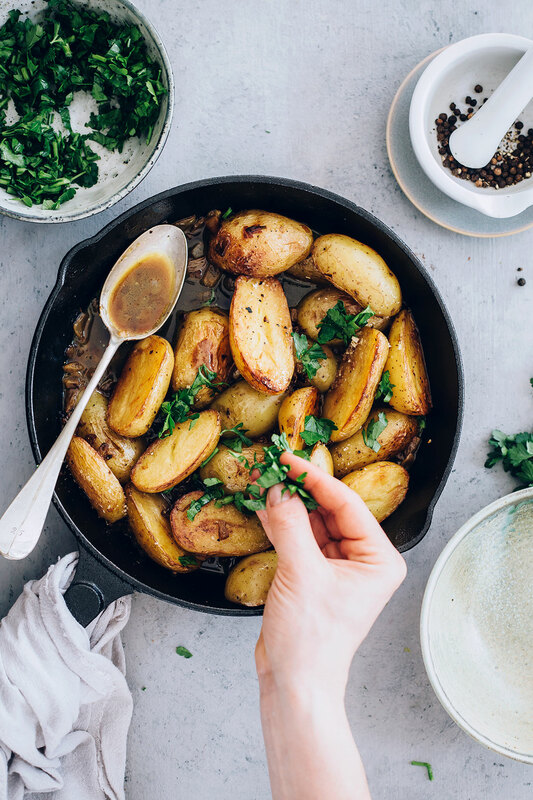 Although these Braised Fingerling Potatoes are delicious as-is, I like to add a handful or two of fresh herbs to really embrace the whole springtime theme. Potatoes are such a blank slate that just about any herbs you like or have on hand will do–if you’re using herbs with a woody stem, like rosemary or thyme, use less than herbs with soft green stems like basil or parsley. A sprinkle of vegetarian Parmesan is a nice finishing touch too. Braising potatoes is totally worth the time! Garnish with your favorite fresh herbs for a flavorful spring side dish. Heat the olive oil and butter in a large cast iron or oven-safe skillet over medium-low heat. Add the onion and cook, stirring often, for 10-15 minutes or until softened. Stir in the potatoes and garlic. Increase the heat to medium-high and continue to cook until the potatoes are beginning to brown, about 10 minutes. Pour the broth into the skillet and remove from heat. Cover the skillet and place it in the preheated oven. Bake covered for about 10 minutes, until the potatoes are tender, then remove the cover and cook until the liquid has reduced into a thick sauce that coats the potatoes, about 15-20 minutes more. Season with salt and pepper to taste; serve with fresh herbs and Parmesan, if desired.